"Private Zones obviates the need to setup and manage custom DNS servers. 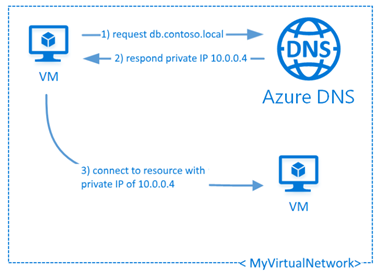 You can bring DNS zones to your virtual network as you lift-and-shift applications to the Azure cloud, or if you are building Cloud-Native applications. You also have the flexibility to use custom domain names, such as your company’s domain name." "A private hosted zone is a container that holds information about how you want to route traffic for a domain and its subdomains within one or more Amazon Virtual Private Clouds (Amazon VPCs)." Azure has more granular control of placement of VMs with "Availability Sets" (essentially server racks) so it now provides more reliability features.